Crisp, cool mornings and chilly nights make me crave a good soup. I absolutely love hamburger vegetable soup. It reminds me of my childhood. My Nana would often whip up a pot of this delicious soup for our family dinners on Sundays after church. The taste always takes me back to those days when our entire family would gather for a hearty meal. I’m currently pregnant with my third baby and have learned that freezer cooking before baby’s birth saves a lot of time and worry after the baby is born. So I decided to make a huge pot of my hamburger vegetable soup. Half of it went into our bellies for dinner and the rest went into the freezer. I know this will be a welcome meal on a night that I just don’t want to cook, but want some comfort food. 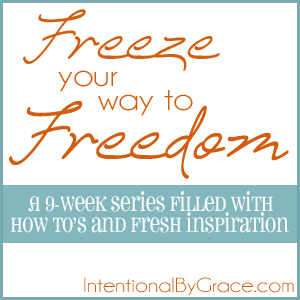 Join me over at Intentional By Grace to see how I make hamburger vegetable soup and how I freeze it for later!